On Friday the Al Jazeera’s program Up Front spoke on the subject matter of Global Warming and interviewed the Black Lives Matter movement leader Deray McKesson. Just prior to the program Al Jazeera ran a story about a wall in Detroit that ran between a poorer black neighborhood and what was once a more affluent mostly white area. Calling the wall a remnant of racism and segregation, the American reporter implied strongly that Detroit had once been a city where segregation was the law of the land. An apparent clever set-up piece for the interview to follow. Before his interview with Deray, Mehdi Hasan walked around like a comedian doing a stand-up comedy routine. The Up Front moderator spoke of Climate Change deniers, comparing skeptics to those who believe in the Illuminati. He went on to skewer those who dare deny the “science” of global scare tactics using a bagful of questionable facts and loony statements. A fitting intro to his Black Lives Matter interview, which was also filled with questionable facts and equally loony statements. Declaring every death of blacks involving cops unjustified, he said that it is a given that America is an inherently racist nation. While one would expect Al Jazeera to parade propaganda as news, the fact that up to a billion clueless people listen to its tripe is disconcerting. Still, when one looks at the American press is it anymore reliable? How different is psuedo journalist come propagandist Mehdi Hasan from CNBC’s lead Republican debate moderator John Harwood? In all likelihood, if the two could exchanged roles their scripts would remained the same. 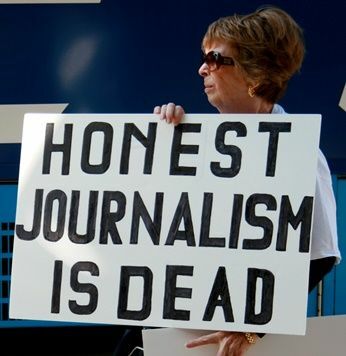 There was a time when reporters were true blue or at least people believed they were. Dogged searchers for the truth was how the public saw them. If it is printed in the The Sun it must be true is what Virginia’s father told her. Superman, a symbol of truth justice and the American way, was given the fitting alter ego of a reporter. In the 1960’s the CBS news anchor Walter Cronkite was called the Most Trusted Man in America. Today news reporters compete with lawyers and politicians as to who is seen as the most despicable. It is the fall of the Main Stream Media that is responsible for the rise of Fox News. While it is often cited as America’s most trusted network, that is akin to being named most honest out of a den of thieves. Today alternative media sources like blogs, and conservative news sites like Breitbart fill in much of the gaps left by the liberal dominated press, but these can’t take the place of main stream news outlets with their ability to reach large audiences. While the continuing downfall of the press and its bias has been spoken about for decades, nothing has slowed the downward spiral. What was once a debatable subject in some circles has become beyond question. The truth is, the “when did you stop beating your wife” questions at the CNBC debate were only slightly worse than what was seen at the CNN debate. Even Fox News was far from even handed, but was at least the best of the frey so far. All that Harwood did was push the limit of unscrupulous advocacy journalism a bit further than the rest, and thus incurred the wrath of Ted Cruz. After Ted spoke up, the rest of the field piled on as well. Long overdue, but a sad commentary nonetheless. The press is a necessary institution for a free people. A watch dog on government and even dishonest businesses, it lets people know when all is not right. On the other hand, when it becomes a pawn of special interests, government or anyone else, it ceases to be useful and becomes a bane to society. Much of the American press has reached this point. What needs to be understood is that the downfall of the press is a danger to the future of the United States, just as much as its spiraling debt, monetary bubble, weakening military, and morale decline. Without it the people languish for lack of truth and accountability. When propaganda is passed off as news and lies become truth in a dance of deception, it leaves a nervous, confused and angry populous in its wake. In such an environment talk of conspiracies run rampant and what is real becomes indecipherable from what is not. What the world needs is more honest journalists, men and women not afraid to seek the truth, no mater where it leads them. Journalist who treat their job as the higher calling it is. Something that will only happen when enough of the citizenry stand up and demand more accountability.